Peterborough Phantoms slipped to defeat in a second NIHL Division One South top-of-the-table showdown in the space of three days. The city men were beaten 4-3 by Basingstoke at Planet Ice on New Year’s Day – a result which cancelled out a fine Saturday success in the reverse fixture in Hampshire. Phantoms also lost top spot to the Bison, who boast a superior goal difference with the two teams level on points. They also have a game in hand. 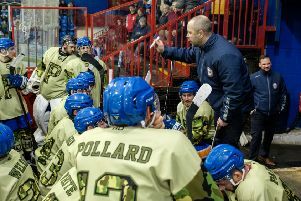 But head coach Slava Koulikov refused to be downbeat following the conclusion of a testing run of fixtures that saw them take three points from two clashes against another set of title contenders – Swindon – ahead of the battles against Basingstoke. He said: “On Saturday we managed to steal the game in Basingstoke whereas last night we dominated the possession, but didn’t get the bounces and they struck with a couple of goals on breakaways from our mistakes. “We have to learn from this and move forward, but we’ve played four games in a few days against other teams battling for the league and have come out of them with five points. “That’s more than 50 per cent and I’m pleased with it. We know we could have been four points clear at the top if we beat Basingstoke again, but we could also have picked up zero points from a really tough run of games. The latest clash between Phantoms and Basingstoke was one of very few shots – the visitors managed 25 compared to Phantoms’ tally of just 23 – and even fewer penalties. Bison committed two indiscretions (one of which was punished by a Phantoms goal) while Will Weldon was the only home player to visit the box for a hooking offence in the early stages. Basingstoke hit the front courtesy of a Hallam Wilson strike which was allowed to stand despite the net appearing to be dislodged from its moorings. Phantoms needed little more than two minutes to reply as defenceman Scott Robson struck on a powerplay, but the visitors regained the lead through Kurt Reynolds late in the first period. Their advantage grew in the middle stanza thanks to breakaway goals from Dan Davies and Ivan Antonov which sandwiched an Ales Padelek effort for Phantoms. The city side cut their arrears through Darius Pliskauskas in the closing session, but couldn’t claw their way back onto level terms. Phantoms return to league action on Sunday (January 7) with an away date against London Raiders. The 5.30pm clash at Lee Valley is their only fixture of the weekend. Before then they have a crucial NIHL National Cup clash on Thursday (January 4) when hosting Sheffield at Planet Ice (7.45pm). Phantoms need to beat the Steeldogs to keep alive their hopes of taking second spot in Group B to advance to the latter stages of the competition.